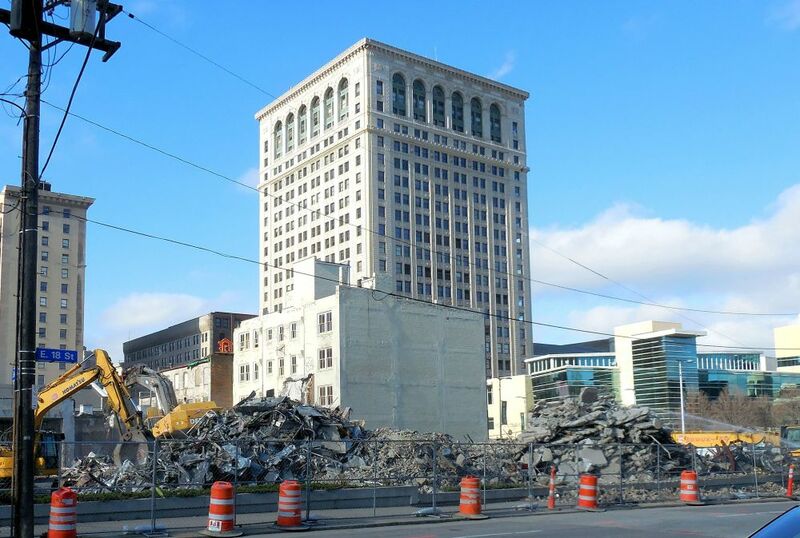 1750 Euclid Avenue, Federation's headquarters for 45 years, is demolished. December 2015 1750 Euclid Avenue, Federation's home from 1965 to 2010, is torn down. 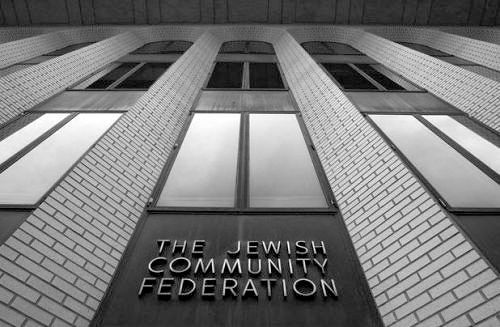 In 1965 the opening of the Jewish Federation of Cleveland's building at 1750 Euclid Avenue, designed by renowned architect Edward Durell Stone, was seen as a commitment to the city, for even then almost all Jews in the area lived in the eastern suburbs. The Plain Dealer picture on the right shows the building's main entrance on Euclid Avenue. In July 2008, when the lower picture on the right was taken, many in the Jewish community were engaged in a vigorous conversation on the question "Should a new Federation headquarters be built downtown (a commitment to the city), or in an eastern suburb such as Beachwood (the center of the Jewish population and near most Jewish agencies)? 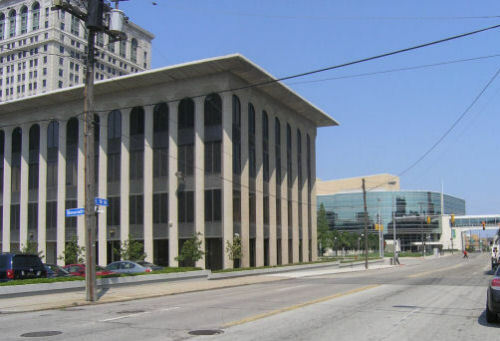 Discussions ended September 11, 2008, when Federation trustees approved retaining the 1750 Euclid Avenue building for meetings, with offices for the president and the Community Relations staff, and a move to Beachwood for operations. See our page that documents that decision. Later that month Federation bought the headquarters of Lamson & Sessions on Science Park Drive in Beachwood, a building constructed in 1982. Extensive improvements began in 2009. On August 2, 2010 all the staff moved in, leaving both downtown buildings unoccupied. The next week the new building was dedicated, named to honor the Mandel brothers whose generous gift had paid for its purchase and renovation. The following month Federation offered the two now-vacant downtown buildings rent free to the Cleveland schools, an offer that they declined in 2011. In a CJN story on September 7, 2012, Federation Board Chair Michael D. Siegal was quoted "We are considering multiple options for the future use of the downtown buildings." Stories of a possible sale to Clayco Realty, a company that develops student housing, appeared in December 2013. Clayco's project was approved by the City Planning Commission in 2014 and again in early 2015. It includes apartments for students and others, plus a parking structure on Prospect Avenue. In June 2015 Federation sold 1750 Euclid and 1720 Euclid to Clayco for $3.6 million. 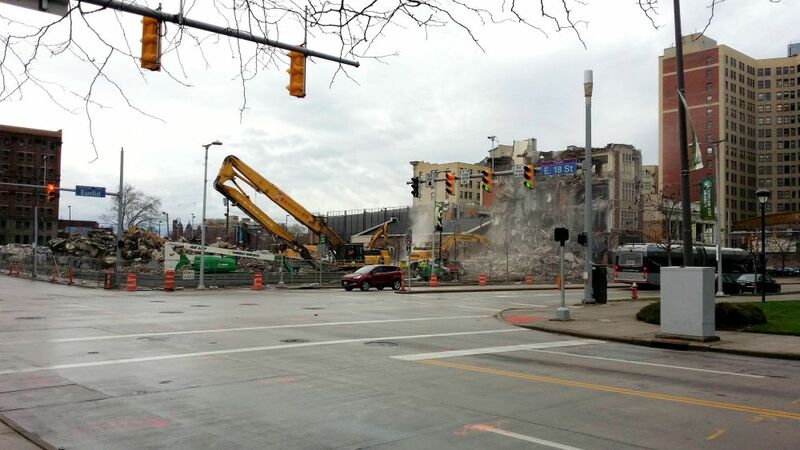 Demolition of 1750 Euclid began on Tuesday December 15. When I arrived at noon Thursday the building had been reduced to rubble and the rubble had been sorted for removal for recycling or to landfills. What had taken nearly two years to plan and build had come down in two days. 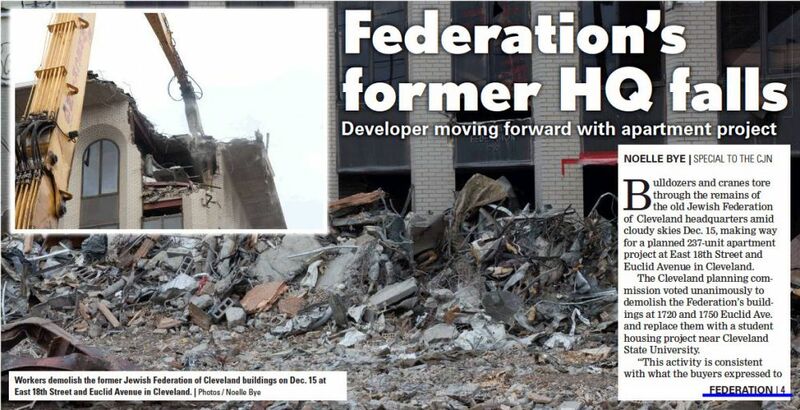 Above: The cover of the Cleveland Jewish News of December 18, 2015 showed the start of the demolition of 1750 Euclid Avenue. The second paragraph is incorrect. The Cleveland Planning Commission did not vote for the demolition. They approved the design of the project. It was the developers of the apartments, Clayco Realty, who decided to demolish the old buildings and invest in a new structure. They call the project an apartment building, knowing that many who are not CSU students will want to rent its furnished apartments. Below: Noon Wednesday December 23, looking southwest across Euclid Avenue. Only a third of 1720 Euclid, built in the 1920s, still stands. A timeline of the events leading to the move to Beachwood. Federation's history and its many homes over the years. Federation Board of Trustees decision of September 11, 2008. CJN story of September 7, 2012 "What became of 1750 Euclid Avenue?" The past uses of this site. It was a parking lot before it became home to Federation in 1965. What was it before that? Look for a "looking back" page soon. Euclid Avenue street view of the apartment building that Clayco Realty Group will construct on this site. 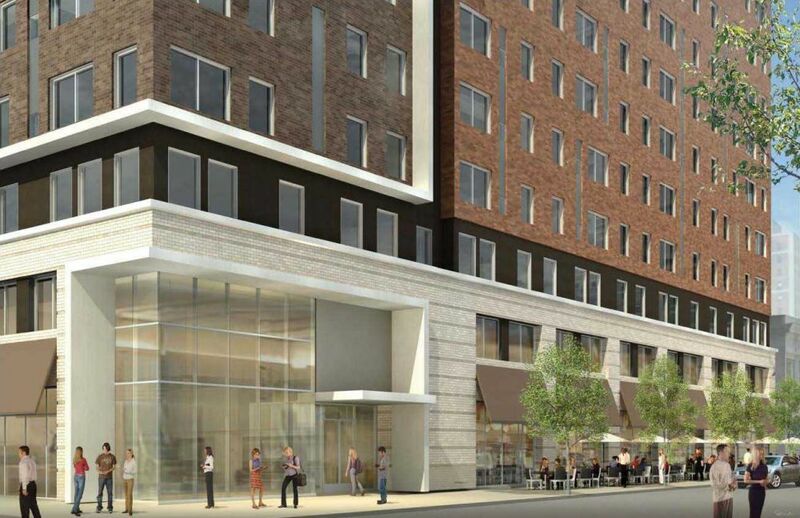 Eight stories high, its address will be 1750 Euclid Avenue. Source: Plain Dealer page.